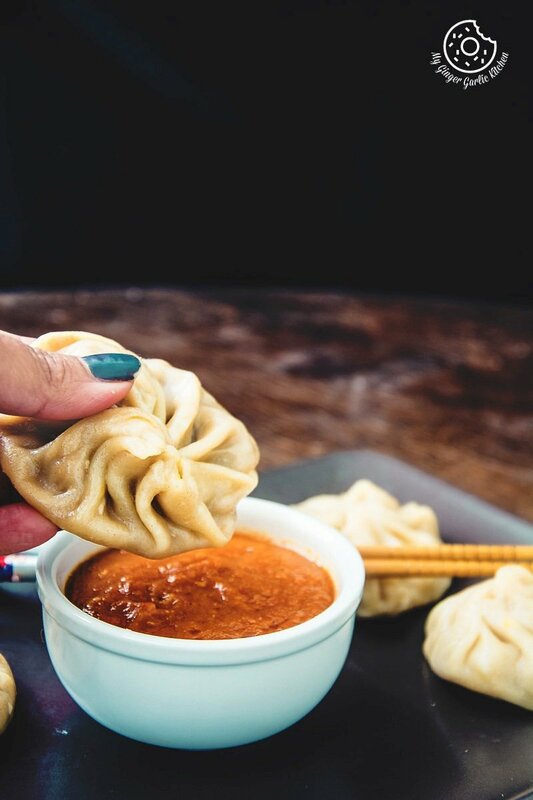 Learn how to make Indulgent Steamed Veg Momos With Spicy Chili Chutney | Vegetable Dim Sum Recipe Recipe with step-by-step video instructions. 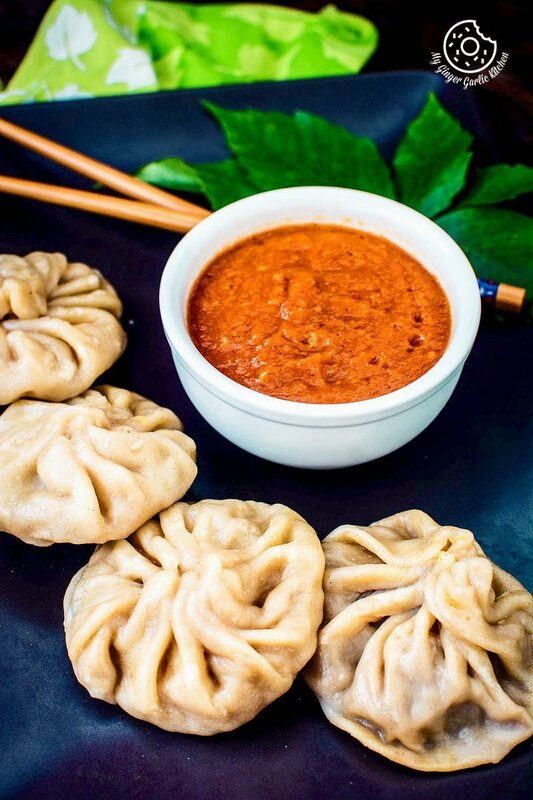 Recipe for Tibetan steamed veg momos aka dim sum with the spicy and sweet chili tomato sauce. Momos are also known as dim sum, wontons. Happy mid-week you pretty people! Today I have my very favorite recipe to share with you all. 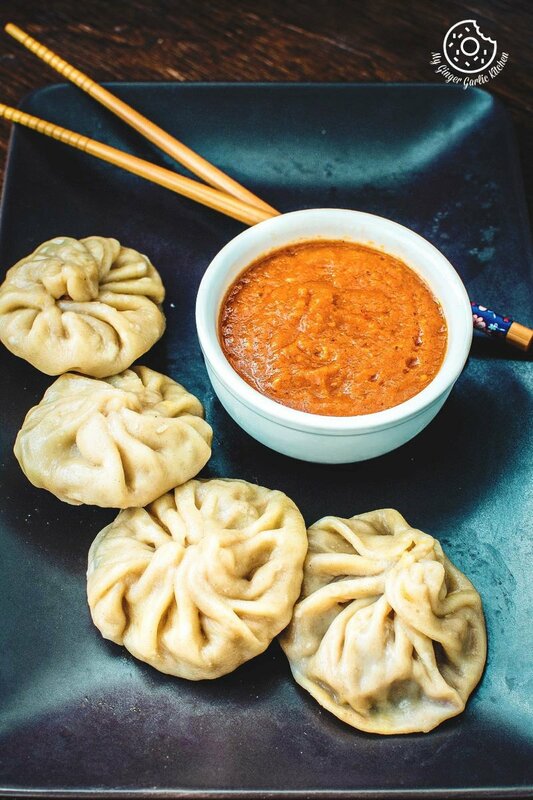 I am sharing the recipe of popular Tibetan / Nepali Steamed Veg Momos With Spicy Chili Chutney which is traditionally served with this Momos. Well, I absolutely can not declare that these Momos belong to which part of the world because I have no idea of its beginning and I am surely not too much familiar with these Momos. There are many types of savory momos depending upon their stuffing and cooking techniques such as steaming, frying, and boiling. Momos are also known as dim sum, wontons. These bite-sized savory steamed dumplings can be made with different fillings such as lamb, mushrooms, chicken, minced meat, veggies, veggies+tofu, shrimp and countless more. Today I am sharing a very raw (basic) veggie version of these This is Steamed Veg Momos With Spicy Chili Chutney | Vegetable Dim Sum Recipe. And the best part is that everything is made from scratch. 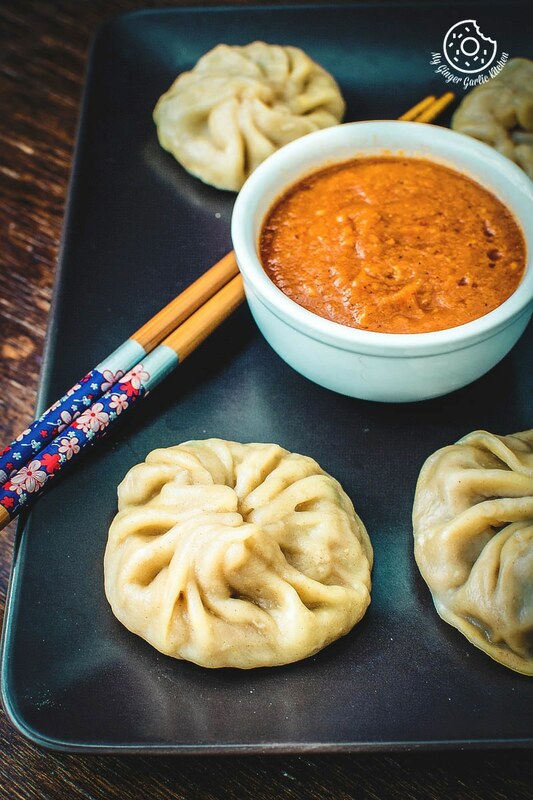 Preparation for these momos and making them is super smooth, but it is little time taking. However, I can also assure you that making these momos can really be faster if you have a helping hand or two who would assist you in rolling and pleating. I personally like to do the pleating part — that’s so enormously artsy. 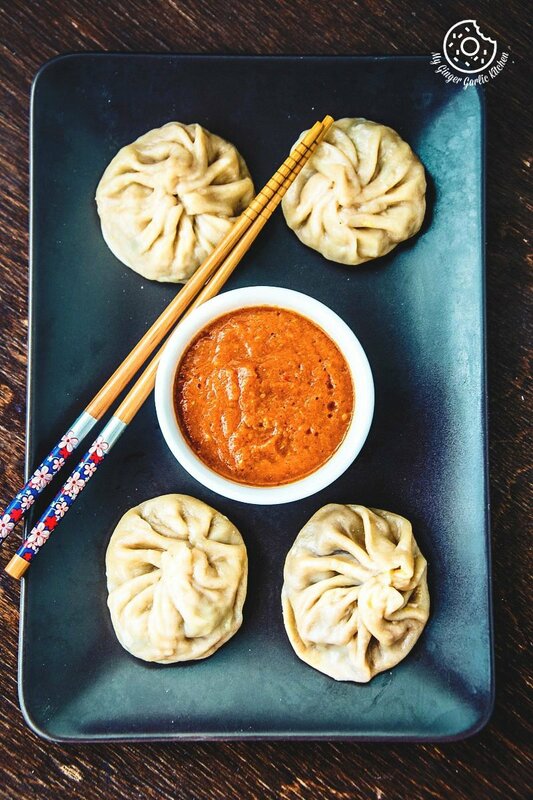 Another good news is that making these momos do not require any complex kitchen tools. Just a rolling pin and bowl of water is all you need to create the most alluring momos. Momos are very popular street food in a Northern part of India. I still remember the delicious taste and enchanting looks of the momos when I had them the first time many years ago. It was the time when I used to live in India. I ate momos on a street vendor’s kiosk as a snack, and I must say they were the best momos I have ever had until today. Mmmm, those hot veggie stuffed dumplings with spicy and sweet chili tomato chutney were out of this world. 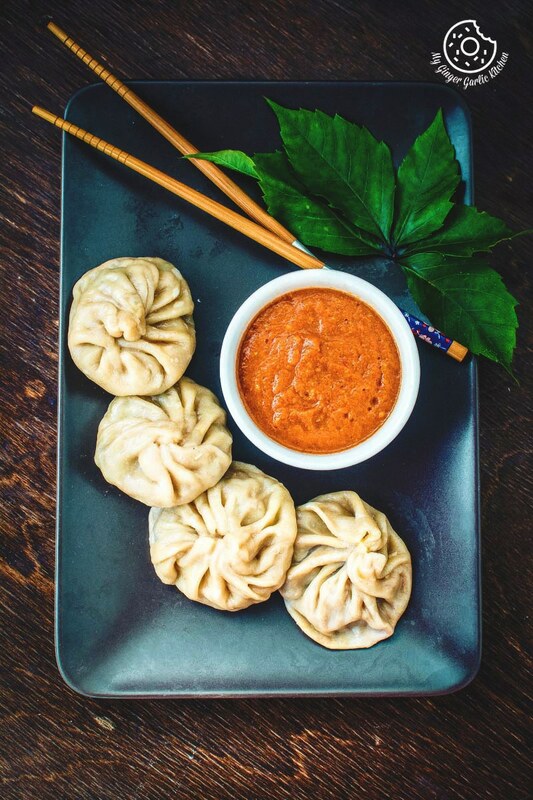 The momos are delightful as a snack, but they can also make a light and satisfying meal for any time of the day. The key to making perfectly balanced momos is to keep the veggies stuffing-less spicier and then serve it with hot red sauce. This way your tongue would sense all the balanced flavors at the same time. As I mentioned earlier that there are different types of momos — steamed momos, fried momos and sautéd and cooked in water. My personal favorite is the steamed one, so I have decided to share these steamed ones with you all. I can’t deny that these street style dumplings are so versatile. Also making this Steamed Veg Momos With Spicy Chili Chutney | Vegetable Dim Sum Recipe is super easy and fun. I know for some people, they might appear overwhelming, but I tell you, you just need to master the technique of pleating and twisting the dumplings. That’s it. Believe me, that pleating dumpling is no rocket science because if I can do it you can certainly do it too. So be patient while making this, because patience is virtue my dear friend and all good things come to those who are patient. Don’t you believe it too? It’s the same with these dumplings. 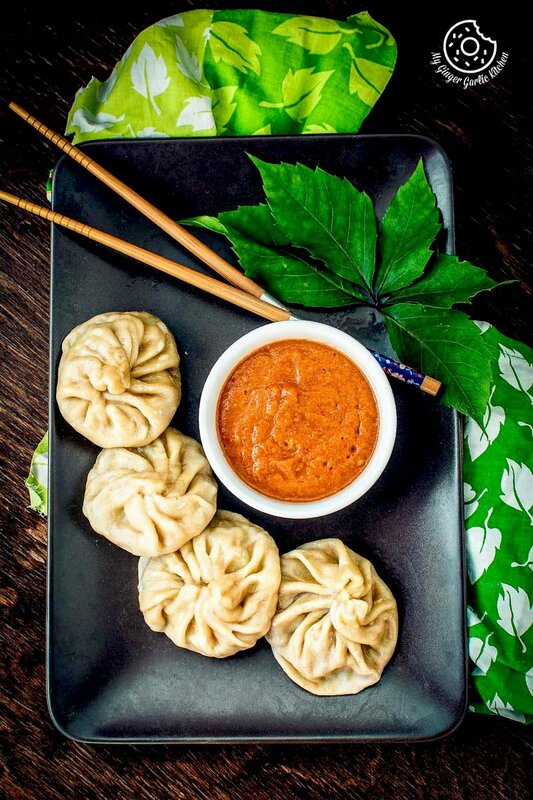 Try these steamed momos with chutney at home and get ready to be enthralled by the bursting spicy and tangy flavors and wonderful textures in each bite. 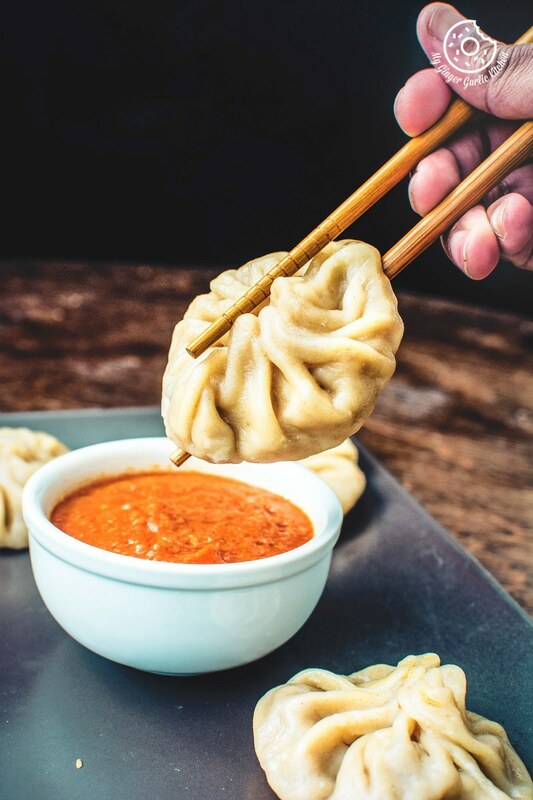 You can make these momos also with wonton papers, but making them from scratch is so much fresh and delicious. That’s why I always prefer making my own dough. Last but not least, the good news is that these momos are vegan too. Learn to make popular Tibetan steamed veg momos aka dim sum. 4. Cover it and let it rest for 30 minutes. 2. Add the chopped onions and saute for 2 minutes. 3. Now add ginger garlic paste and stir well. 4. Saute on high heat for 2 mins. 5. Now add grated carrots, grated cabbage, chopped bell pepper, and 2 tbsp sliced spring onions greens. 6. Stir well and cook on high heat for 3 mins or until glossy. 7. Turn off the heat, and add the soy sauce, salt, black pepper, and 1 tbsp sliced spring onions greens. 12. 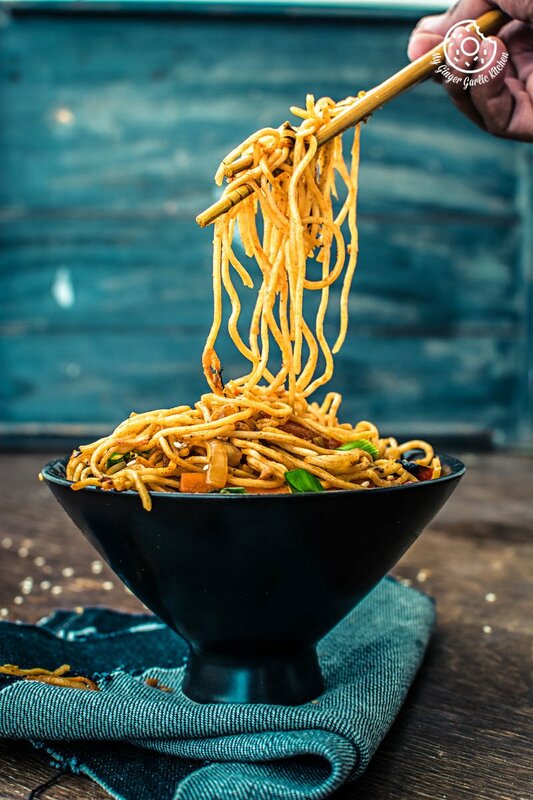 Serve with momos chutney. Learn to make spicy and sweet momos chutney. 1. Boil about 1½ cup of water in a pot. 2. Add tomatoes and red chilies to the hot water and boil on high for 5-6 minutes or until tomatoes skin start to peel off. 4. Let it cool down. 5. Remove the tomato skin and drain the excess water. 6. Transfer peeled tomatoes, cooked dried red chilies, salt, sugar, ground black pepper, ginger, garlic, and vinegar. 7. Blend to make a smooth puree.